Baby Milk Action press release 9 September 2014. Toronto International Film Festival (TIFF) 8 September: Oscar-winning director, Danis Tanovic, took to the stage to resounding applause following the screening of Tigers, his new 90-minute fact-based drama, and revealed that the character played by Emraan Hashmi, called Ayan in the film, was actually in the theatre. Syed Aamir Raza, the former Nestlé formula salesman, and his wife Shafqat, took on the world’s largest food company when they realised that babies were dying as a result of aggressive marketing. 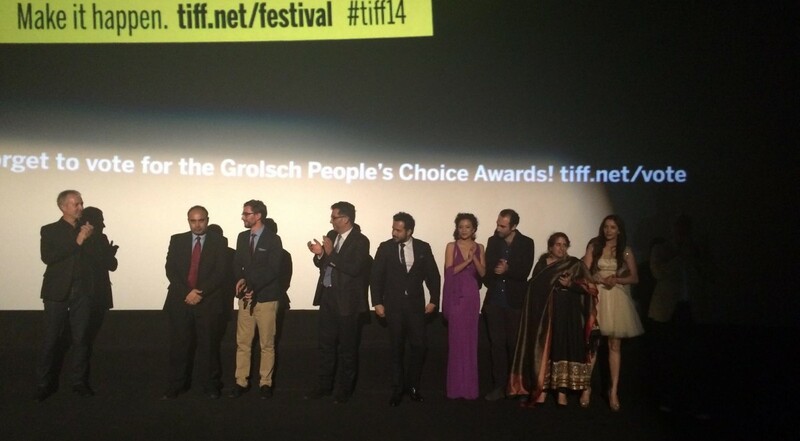 They joined the director, producers and stars on stage to a standing ovation. The International Baby Food Action Network (IBFAN) came to Aamir’s aid when he called on Nestlé to stop pushing formula and is represented in the film as ‘The HUB’. The character Maggi, played by Maryam D’Abo, is an amalgamation of several IBFANers, three of whom were at the premiere, co-writer Andy Paterson told the audience: Baby Milk Action’s Patti Rundall and Mike Brady from the UK (who also acted as consultants to the filmmakers) and Tracey Wagner-Rizvi, who worked at the IBFAN group in Pakistan. High resolution photo available on official Tigers Facebook page. 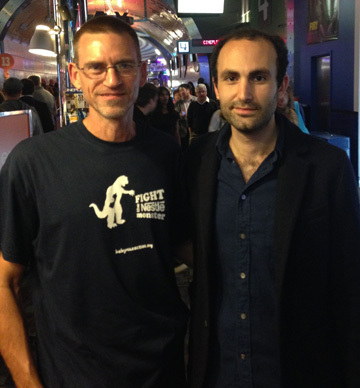 Mike Brady with Khalid Abdalla, who plays the Director battling to make a film exposing the baby milk pushers. Photo: Baby Milk Action. Fight the Nestlé Monster t-shirts can be ordered in Baby Milk Action’s Virtual Shop. 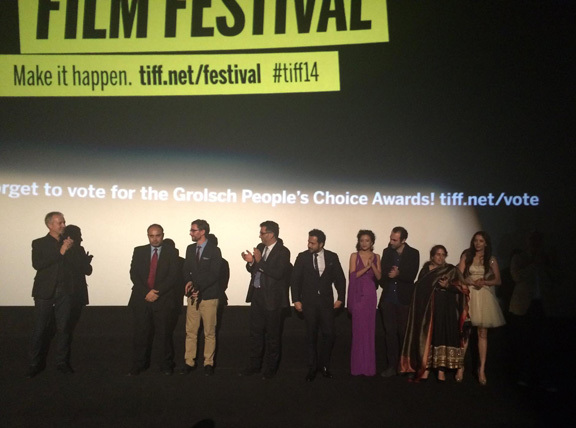 The film will be shown again at TIFF on Wednesday and Saturday (click here for tickets). There is also a showing for accredited media on 10 September, 9:15PM, Scotiabank 7 (Scotiabank Theatre). The film then moves to the San Sebastian International Film Festival for a screening on 25 September. Hollywood Reporter review: ‘Writer-director Danis Tanovich explores the power of multinationals, the media and ethics in a finely crafted true-life story’. 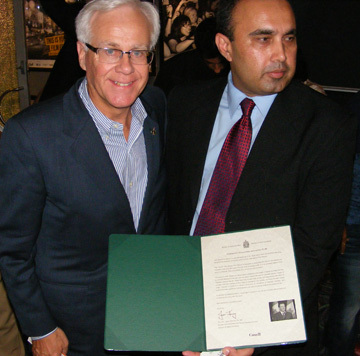 A letter from the Minister for Multiculturalism, Jason Kenney, PC, MP, was presented to Syed Aamir Raza by his representative, Bob DechertMP. ‘The Toronto International Film Festival is dedicated to presenting the best of international and Canadian cinema to film lovers from an array of backgrounds. It is an excellent platform from which to share Mr. Raza’s incredible story of courage and conviction. 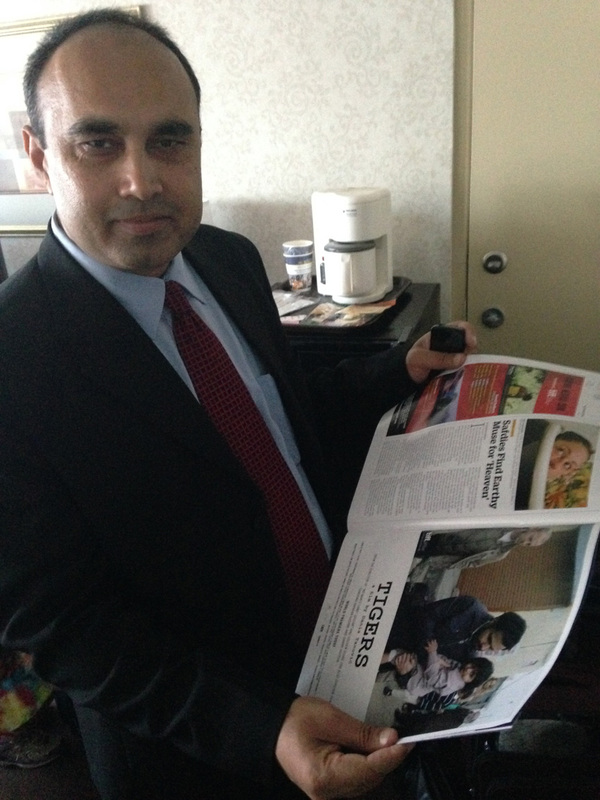 ‘The account of Mr. Raza’s principled stand in defence of the health of babies and their families is one that deserves to be told, and one which reflects the best of Canadian values…. Aamir now lives in Toronto with his family and drives a taxi. 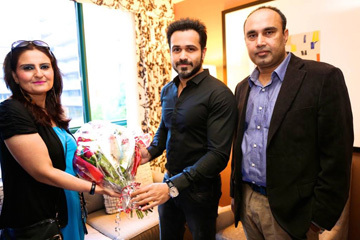 He appears in the film as Ayan, played by Emraan Hasmi, who met him and Shafqat prior to the premiere. Shafqat is played by Geetanjali. One issue that Aamir’s situation highlighted was the impossibility of seeking refuge from a corporation. When Aamir was unable to return to Pakistan after the events depicted in the film, Infact Canada and others campaigned for his right to stay, a struggle beset with obstacles. In the end it took letter writing campaigns, petitions and the pro bono assistance of a prominent lawyer to secure his right to remain. IBFAN continues to campaign against aggressive and misleading marketing of breastmilk substitutes by all companies in the developing and industrialised world and for the regulations introduced in Pakistan following the stand taken by Aamir to be fully implemented and enforced. People can also sign up to be alerted when Tigers comes to their location.